This is by no means a guide on how to dominate SEO in 2018. 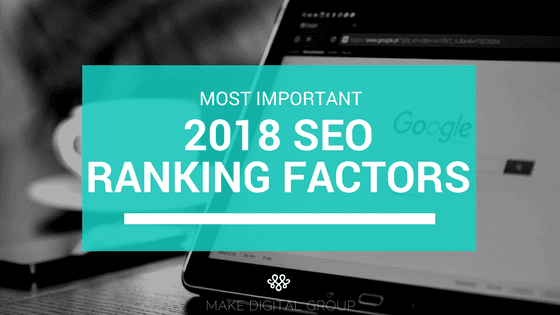 What it actually is, is a list of important factors to consider as you tackle SEO in 2018. So, go ahead! Pick and chose the strategies you want to put forth into your strategy this year… we won’t be offended. A descriptive URL provides so much more than a clean breadcrumb train in the Search bar for your visitors to know where they’re at on your site and what to expect. It provides search engines information that they need to properly rank your site and make a decision on whether or not your page will provide the answers the searcher needs. Make sure your URL and all content on your page is easily crawlable by making it available in text readable formats. Yes, this goes for images, videos and other types of visuals that you might have on your page. Making sure your content is properly crawled by bots is crucial. Without this, there is no foundation and none of the following factors will matter. Descriptive URLs get 25% more clicks than generic URLs according to Microsoft. Organic CTR is down, and a significant amount since 2015, actually. But are we really surprised…? No. Google has been crowding out our organic search results with Ads, Carousels, Answer Boxes, “People also ask…” sections and more. Now more than ever our results need to have neon lights and literally scream “unicorn found” to not get ignored, and once there, your UX (user experience) better be flawless, or that back button will be your visitors best friend. Experience has become a strong influence in search engine rankings this year, and with good reason! How can something be helpful if you can’t decipher it or can’t stand looking at it? When people click on your page and actually spend time on it, it sends a very strong message to Google that your page is the answer they were looking for, therefore making a strong case for your page to rank higher. And just the opposite of that, if you start out with a high ranking page, and people quickly bounce off of it, it tells google that the information displayed is not what searchers were looking for, quickly sending messages for your page to rank lower in order to make room for something that best answers the questions and meets the users needs/expectations. 3. WHAT IS DWELL TIME AND HOW DOES IT AFFECT MY RANKINGS? Dwell Time is the amount of time a Google searcher spends on your page. RankBrain, Google’s tool that processes search results, pays a lot of attention to dwell time! So it’s not just about bounce rate anymore, but how long can you keep a user on your site. RankBrain actually measures when someones clicks on your page, how long they stay on that page, and when they go back to the search results page. If you spend a significant amount of time on a page, then that means you probably like the content on it, or walked away for some coffee… but for the sake of this point, let’s say it’s because you like it so you’re reading along. You’re probably not alone! And Google will take notice. Still wondering why is Dwell Time important? A recent study by SearchMetrics supported this theory and found that an average dwell time for first page Google results is 3 minutes and 10 seconds. And really, with how we function today as a society, giving something 3 minutes and then some, probably makes it a legit piece of content. Here are some tips on how to increase Dwell Time for your pages. How do you keep people engaged with your content and on your page for longer than 4 seconds when our brains are now wired for quick information absorption? Ask them questions to keep them engaged! Peak their interest so they can’t help but read the next sentence! Utilize phrases like: But that’s not the best part, Why is this important? But that’s not all… etc. to grab your readers attention, peak their interest and get them to actually want to read your next sentence. Subheading are huge! People want to read key phrases that hit home, not paragraphs where they have to fish for the important information. …And that’s how you can increase your website traffic and lower your bounce rate! You can increase your website traffic and lower your bounce rate if you give the searcher exactly what he/she needs how he/she wants it. Your visitors need to see that YOU have the answer to the question they asked, so make them jump on in with you right away! Make them think that what you believe is what they believe. Truth is, more often than not, searchers know what they’re looking for and just need reassurance. Once they realize you’re both on the same page, they will want to hear what you have to say. Because we trust those that think like us! Seeking similarities and placing our trust in like-minded others is hard wired. Plain and simple, it’s human nature. How to accomplish this little trick? Restate their problem. Better yet, make their problem your problem. A problem you’ve already solved, and you’re here to show them a successful solution they can take back, implement, and be the hero of their own story. Like we mentioned before, your search result now needs flashing lights around a sign that reads “click me” to get noticed, so having creative and attention-grabbing meta descriptions is more critical than ever. Make sure to utilize power words to your description that make the content exclusive and hands down un-missable. Don’t be afraid to utilize your keyword research to create titles and meta descriptions. Are you answering specific question users are constantly searching? Put it in your title! Throw in an emotional hook and watch your traffic roll in. Make sure your title, description, and page content are aligned and relevant to the search terms you’re targeting. Never forget that! 5. WHAT DOES GOOGLE DEEM RELEVANT TO SEARCHERS? Take some time to do some Google SERP research. Although keyword research is a crucial pie of the puzzle here, you should also take the time to research the questions you’re looking to answer specifically. Take the time to look at the results Google is providing to make sure you’ll stand out. Have you read through some of the results currently ranking for that? Are you just going to repeat what they’re currently saying in a word vomit blog or add your own flair? Sky-scraping on an article is totally fine, but filling in a gap that currently exists with the results given is even better. Find a gap in the content currently available. Is there a better way to answer that searched question? Is there a subsequent question that comes along with the one being answered that could be just as beneficial to have the answer to? That’s where you can find your ranking gold. Take a look at all types of content being displayed. Is Google thinking that infographics are best at answering the search question or that lists are a better way to satisfy this particular search craving? Whatever it may be, take a look internally to see if there is a better way for you to display the information currently provided, and you might have found a golden opportunity! Sometimes it’s not about the answer itself but how it’s delivered. Sometimes we get so caught up in the details of how to beat Google at its ranking game that we forget that when we get down to it SEO is still a content and links game. The more links the more credibility, and the only way to get more high-quality backlinks is through high-quality content creation. Content and links should, without a doubt, be a pillar in your SEO strategy in 2018. Without amazing content, you will never get the links you desperately need to get on the coveted first page of Google. Answering the searchers question better than anyone currently on the first page. Making your answer as accessible as possible. If your visitors are frustrated with your answers, Google won’t hesitate and replace you. Don’t take this the wrong way, they still look at these pieces of content and take them into consideration, but you have to keep in mind that Google’s way of ranking pages has evolved, much like our way of searching for information has, making it much smarter than it used to be. Today’s success in search is much about context as it is about content. Always keep in mind that Google’s #1 goal is to show you THE MOST BENEFICIAL result possible. Keyword stuffed pieces are no longer the best way to answer your questions, I mean, were they ever? Gahh I am already starting to relive the frustration of clicking on a result and getting served a sales pitch blog on something totally different… the worst. So that leads us to… What is Google expecting from a good piece of content? They want you to take a topic, a question, or an idea and blow it out of the water. Cover that topic in-depth, and leave no stone unturned! Usually, one question is asked, but you have ten others related questions you are also curious about, so why not just go ahead and answer them all in one piece? This way your visitor doesn’t need to go anywhere else; You’ve got it all covered. Your click-through rate goes up, your dwell time increases, your bounce rate decreases, and Google’s antennas are flooded with positive signals to rank you higher. Don’t be afraid of long content pieces! How can you possibly cover a topic thoroughly in 300 words…? You can’t. Google is currently loving content pieces of 2000 words or more because they accurately and thoroughly answer searchers’ questions. So don’t be shy with your content creation! There is nothing more basic than keyword research. Yes, to some it may sound archaic, but it truly should be one of the founding pillars of your SEO strategy. If you don’t know what your customers are searching for, how can you possibly know how to help them or what questions to answer? Users won’t shape their questions based on the content you’re putting out, so you must figure out what they need and want in order to be relevant in the digital space. You no longer have to have one keyword per page, which reinforces the concept that Google is now also focusing on context. Focus on a primary keyword and branch off of that into some secondary keywords that support the main concept of the page and also share the searcher’s intent. The overall theme and intent of all of these keywords and search terms and phrases should be the same. 9. DEVELOP A STRATEGY THAT INCLUDES SEMANTICALLY CONNECTED PRIMARY, SECONDARY, AND RELATED KEYWORDS. Like we mentioned in the previous factor, you should have a semantic keyword strategy in place to make sure the context of your content is all there and makes sense. Make sure that these keywords are in all of your content in the form of text, because if Google can’t quickly and easily parse it out they might not rank the content you spent a significant amount of time creating because they can’t figure out if it’s relevant or not. So, go ahead and create your 2000 word monster, sprinkle your keywords throughout, make sure you cover the topic thoroughly and take advantage of all the tools at your disposal to create a comprehensive list that is sure to help you provide your searchers with what they’re looking for. Utilize this free tool called LSI Graph! As well as Google Keyword Planner, SEMRush or any other keyword research tool you would like to use! Your page should not only load quickly but look great from a visual perspective. The user experience should be flawless in order to ensure that the end user is able to accomplish their task quickly, easily, and on any device. Is website security part of optimization? A secure website is a trusted website, so make sure your site is HTTPS since this is playing a huge role in what Google is looking for right now and is surely a factor on whether or not your page gets displayed. You wouldn’t want a “warning this site is not secure” notice popping up when someone tries to load your site, would you? Well, these are some of the tactics we’ve started to implement to succeed in SEO in 2018. So what will you do? Optimize your page for speed? Or focus on increasing your CTR through more compelling content? Whichever SEO strategy you’re looking to implement, drop us a quick note and let us know! And don’t forget you can always reach out to us and get more information on how to evolve your brand or how to get in touch with the right digital marketing agency.